It’s here! This week we celebrate my third blog anniversary and my birthday. January 7, 2006 was the day I found the first comment on my little online cooking database—it had been there for a couple weeks—and suddenly I realized I had a cooking blog. It’s also the day I found out I was pregnant with Monkey Boy, but that’s another story. Since we have two big things to celebrate I thought it would be fun to have some giveaways, so be on the lookout for at least one giveaway each week through the end of the month. This week’s giveaway is sponsored by Stonyfield Farm. I’ll say this right up front: we are a family of yogurt eaters, and Stonyfield Farm is my favorite yogurt. I got hooked on the French Vanilla years ago and have been eating and cooking with their yogurts ever since. 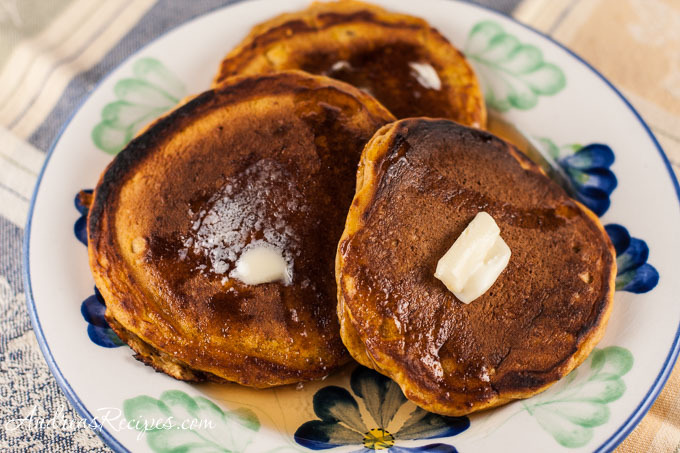 This pancake recipe from the Stonyfield website uses plain yogurt and pumpkin puree to make easy and fluffy pancakes. These are a family favorite and a great way to finish off any leftover pumpkin from holiday baking. Use fresh homemade puree or canned, whatever suits you. This week’s prize package from Stonyfield Farm includes $50 worth of coupons for free delicious and healthy Stonyfield Farm yogurt, a reusable shopping bag, oven mitt, and spatula. If you want to win this package, leave a comment telling us about your favorite recipe that uses yogurt. Please make sure your email address is correct so I can contact you if you are the lucky winner. Apologies to my international readers, but the prize can only be shipped within the continental U.S. The contest closes at midnight EST on January 7, and Random.org will select the winner. Look for the announcement of the winner in this post later this week. UPDATE: Congratulations to Rhonda, comment #13, the winner of the giveaway! Thanks to everyone for entering. In a large bowl, whisk together the flour, sugar, salt, baking powder, baking soda, cinnamon, ginger, and cloves. In a the small bowl, beat the eggs, then add the vanilla, yogurt, milk and pumpkin puree. Mix well. Pour the egg mixture into the flour mixture and stir just until all the flour is blended in, but don't beat it. Spoon the batter onto a preheated, oiled griddle, using 1/4 cup batter for each pancake. Cook pancakes slowly over a medium heat for 3 minutes, when bubbles break on the surface and the edges are set. Flip and cook for another 1 to 2 minutes. Keep warm on a covered plate while cooking the rest. Serve with maple syrup. well i love yoghurt as such but favourite way to use is up would be lemon yoghurt cake which my family cant get enough of………. Congratulations on your third anniversary! I love pumpkin pancakes – it’s my favorite sit-down breakfast treat! Happy Birthday and Blog Birthday! It’s been a pleasure getting to know you through your blog! Pancakes are a great way to celebrate! Those pancakes are looking good…..mmmmmmm! I love Stonyfield farm! I’m not a milk drinker and when I was pregnant, I lived on their Chocolate Underground yogurt to get my calcium intake. Now I actually enjoy eating yogurt thanks to Stonyfield. Whoops, forgot to mention my fave yogurt recipe. I use yogurt in my scones. My favorite yogurt recipe is Beef Strogonoff. I use plain yogurt to replace the sour cream and it tastes just as good. I mix the yogurt up with a little milk to smooth it out and it cuts down on the calories as well. I LOVE plain yogurt and usually use it to replace any recipe with sour cream. yum pumpkin pancakes! they look great! my favorite recipe using yogurt is my muffin recipe! i actually always use Stonyfield! Happy birthday both bloggy and otherwise! Congrats on the your blogiversary! We love Stoneyfield yogurt! I substitute plain lowfat yogurt any time sour cream is called for. If need be, I drain it over cheesecloth or paper towels for a few hours to thicken it up if, say, I’m using it for a dip. Yogurt is so much healthier than sour cream. Congratulations on your blog birthday, and your birthday! My favorite yogurt recipe of all time is Barefoot Contessa’s lemon-yogurt cake. It’s easy to make, and always knocks my socks off. Congratulations on your 3rd blogaversary! I love adding yogurt to any cake mix when I’m making cupcakes for kids. It makes the cupcakes nice and moist. Use blueberries or raspberries in these tasty streusel-topped yogurt muffins. Heat oven to 400°. Lightly grease and flour muffin cups or line with paper or foil liners. In bowl combine yogurt, milk, granulated sugar, 1/4 cup brown sugar, melted butter, and egg. In separate bowl stir together flour, baking powder, salt and baking soda. Combine the mixtures, stirring only until dry ingredients are moistened. Gently fold in berries. Spoon into muffin cups. In a small bowl combine the topping ingredients with a fork until crumbly. Top muffins with crumb topping. Bake the muffins for 20 to 25 minutes. Makes about 12 to 15 muffins. I make a lemon-yogurt pound cake from a recipe I got from an old Amish cookbook. I HAVE to bring it to family functions or they’ll mutiny, that’s how good it is! Thanks so much for the giveaway and happy blogiversary! Our son gave up milk in favor of yogurt and eats about 4 quarts a day. Stoneyfield Farm is definitely one of our favorites. We’ve even been to the factory! My mom has a lemon yogurt bread recipe that is divine! It uses lemon extract and vanilla yogurt. Andrea, please don’t enter my name in the contest, I just wanted to comment on how delicious the pancakes look; the ginger sounds like a wonderful addition. Btw, I’m also a big Stoney Farms fan; I always buy the plain yogurt and use it in just about anything I bake. Congratulations on your Blogoversary! I would love to be entered into this yogurt contest. My favorite way to eat yogurt is to make raitas as a side dish for curries and for our onion bhajis. I mix in coriander, cumin seeds, grated cucumber and lemon juice and other spices and herbs when they are around. My favorite recipe is actually a recipe I’ve made quite a few times for scones with either fruit or white chocolate. So good. oh what a giveaway! My favorite way is to replace yogurt for sour cream other then sitting down to one of those yoplait whips which taste like jello/cool whip-YUM! But on a side note, we keep plain yogurt around here ‘cus hubs just LOVES plain yogurt mixed with anything crunchy…granola preferrably. I have a recipe for light pumpkin loaf that uses yogurt. YUM! I got an ice cream maker for Christmas, so I’m anxious to try my hand at making frozen yogurt!!! I don’t cook much but one of my favorite desserts requires no cooking. I buy one premade Angel Food Cakes, a couple of Pints of Strawberry (which I clean and thinly slice and 2 large containers of yogurt. I slice the angel food cake into two layers. I mix the strawberries and yogurt together in a bowl. I then layer the yogurt and strawberries over each layer of cake puting one on top of the other. Then I put a little more over the top. What I don’t use of the yogurt and strawberries I save for eating later. I chill the cake for about and hour and voila a nice heathy version of strawberry shortcake. My favorite recipe using yogurt is one I got from a woman’s magazine years ago. It’s called “Fruited yogurt cake”. It is made in a 9-inch square pan and is similar to a sour cream coffeecake with a cinnamon, raisin, and nut layer. I also have another good recipe for a yogurt spice cake with a broiled-on coconut, walnut and brown sugar frosting. 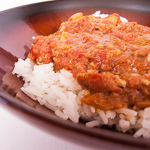 We use yogurt to marinate lamb in…YUM! First of all thanks for the recipe, I love pumpkin and I love pancakes so I don’t know why I don’t already have a recipe for this. Anyway my fav recipe with yogurt is pumpkin pie. I love it because it reduces the calorie and its still creamy. It makes great tzaziki sauce! I’m also hooked on Stonyfield Farm Yogurt. I can’t say I have a favorite recipe using yogurt. I make different flavored muffins weekly and always use SF yogurt in them. We love Stonyfield Farm yogurt. Because of diabetes in the family (and my son’s HUGE appetite), I limit his sugar. I recently started mixing plain yogurt with a drizzle of Agave Nectar (a low glycemic index natural sweetener) in place of sugar or honey. The kids love it! My favorite yogurt recipe was for a wonderful european yogurt cake that I discovered some years ago when I was looking for a cake idea for my grandson’s birthday. He hadn’t had much sugar yet and his mom and dad didn’t want to go wild when they knew he would be just as happy with a more subtle flavor. The cake was wonderful, made with yogurt and eggs and vanilla, and we all loved it. I didn’t frost it and it was a perfect tea cake for child and adult. Mmmm, now where did I put that recipe? I dont use a recipe persay, but my favorite thing to use yogurt for is yummy, healthy smoothies! We really love to make parfaits with yogurt. We eat yogurt in smoothies all summer long! We LOVE yogurt plain all year long! Most frequently I use yogurt as a way to add oomph to smoothies (drunk daily) but more interesting is putting it in squash soup! I use yogurtly most for making my fresh berry smoothies. Also used a lot with baking to moisten my cakes or muffins. We make our own (after many tweaks) version of a very healthy muffin. 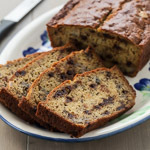 It has bananas, yogurt, wheat flour, flax seed, soy flour, wheat bran, an egg, oatmeal, poppy seeds, baking soda and smart balance. Yummers!! And healthy too :-). My favorite recipe with yogurt is to use it in a quiche. Makes the recipe much healthier and tastes great! My favorite yogurt recipe is for Tandoori Chicken Strips with a yogurt dip. The recipe calls for plain yogurt mixed with the juice of one lemon. It is so simple and so good it really enhances the nutrition of the meal and the taste. When I make this dish the yogurt dipping sauce never goes unfinished. Even my one year old likes it! OK so not a recipe but we eat this often: Yogurt instead of milk in our granola for breakfast. I marinate my chicken in a mix of yoghurt (full fat plain), salt, pepper, curry powder and mustard seed before I cook with it. 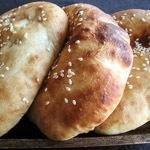 Your recipe for Naan looks great. I will have to try that soon. My favorite use for yogurt is tzatziki and banana bread. Congratulations on your blog anniversary. I love Stonyfield Farm Plain yogurt and in Indian cooking we use it in so many ways marinade, briyani, smoothie, raita. Congrats on 3 YEARS!!! What a huge accomplishment! I use Stonyfield Farm Plain Yogurt everyday in smoothies. There is always someone in the family who wants that for breakfast! My favorite yogurt recipe is an adaptation of Nigella’s Rhubarb Cornmeal Cake. I make it with a little less sugar and whatever sweet-tart fruit is in season. The yogurt gives the cake a pleasant tang and unbeatable moist crumb. I might have to make one with my frozen cranberries soon! As much as I love my mother-in-law’s cheese-stuffed blintzes, I am not fond of heart attacks. I like to put yogurt in instead of the cheese. Same great richness but with less fat! Mmm – I just inspired myself for dinner! Congratulations on 3 years, and Happy Birthday! My favorite recipe with yogurt is a stawberry cinnamon muffin recipe from Cooking Light. The combination of flavors is interesting and very good… and it’s all pretty healthy. I love Stoneyfield Farm. I like to substitute yougurt for heavy cream in pasta dishes. My favorite way to use yogurt is to drain it until it’s very thick, like Greek yogurt, or “almost” yogurt cheese, drizzle on a little honey, and top with fresh berries. I also use it in banana muffins. I use yogurt in a lot of ways, usually just eating it with fruit and granola. I like to use it in baking, too. But the tangy sauce I serve with felafel is one of my favs. I big fat puffy heart LOVE Stonyfield yogurt! I cook with it a lot but one recipe that has gotten rave reviews is a lemon yogurt cream served in phyllo cups with blueberry sauce – so refreshingly yummy! I like to use yogurt to make parfaits: I just layer fresh fruit and granola with yogurt and it makes for a filling, well-rounded breakfast. My favorite recipe with yogurt is FarmGirl’s Blueberry Bran Muffins. We also make whole wheat pancakes and the yogurt really lightens them up. Thanks for the giveaway. I like to use nonfat yogurt in my hummus recipe in place of tahini. It makes for a lighter and healthier hummus!!! Entries for the giveaway are now closed. Thanks for visiting, and the results will be announced soon. Since we can’t get that kind of yogurt here, I won’t enter the giveaway, but I’d have to say a favorite with yogurt is tzaziki. Yum! Sorry I missed this one! When is the next give away? I’d like to know when they all are so I can participate. Great website BTW, the pictures are top notch, I can really imagine what the food tastes like. I mix strawberry yogurt with banana’s .pineapple and fresh strawberries then I fold in low-fat whip cream it. It makes I wonderful desert.